Juliet Mousseau, RSCJ, entered the Society of the Sacred Heart in 2009 and made her first vows in 2012. She lives in St. Louis, Missouri, and serves as associate professor of church history at the Aquinas Institute of Theology. Sarah Kohles, OSF, is a Sister of St. Francis of Dubuque, Iowa. She professed final vows in 2011, and currently she is working on her PhD in biblical studies at Graduate Theological Union in Berkeley. She has formerly served on the Giving Voice core team. "This book opens a window for anyone wanting to know more about the lives of those currently entering religious life." 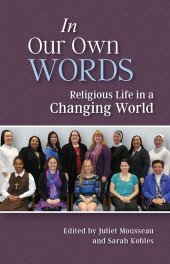 "In Our Own Words is brimming with tremendous insights about the future, ideas that are uncommonly expressed in many religious quarters. This book has opened my eyes to a world that I have recognized only in limited ways to date. In Our Own Words is exceptional and deserves close attention since these convincing and cogent voices are seldom heard in such an expansive narrative." "What has been timeless and essential to religious life, passed on for generations, finds both honor and new expression as these newer members of religious life articulate their experience. This is an important read for all who are interested in the evolution of religious life and its continuing vitality into the future." "This book was born of an expressed need of newer religious for more contemporary work on religious life and the vows. It led them to ask the questions: `If not us, who? If not now, when?' The voices of its thirteen authors pulse with new energy that both inspires and challenges readers. In their sharing of personal stories and scholarly insights, they offer new interpretations to this constantly evolving lifeform in our Church and world today."